7252. “J S Webb,” Find-A-Grave, https://www.findagrave.com/memorial/42130424, 42130424. 7253. “Nancy J Webb,” Find-A-Grave, https://www.findagrave.com/memorial/42130407, 42130407. 7254. “Calvin D Fender,” Find-A-Grave, https://www.findagrave.com/memorial/64672474, 64672474. 7255. “Rosanna Smull,” Find-A-Grave, https://www.findagrave.com/memorial/68627348, 68627348. 7256. “William Smull,” Find-A-Grave, https://www.findagrave.com/memorial/68627256, 68627256. 7257. Evelyn Elverda Sturm, “Duplicate Certificate of Birth,” May 24, 1912, Sacramento, Sacramento County, CA. 7264. Linda Marie Ramfjord, “Minnesota Birth Index, 1935-2002,” February 26, 1955, Saint Louis County, MN, 1955-MN-052311, https://www.familysearch.org/ark:/61903/1:1:VCJT-ZPV. 7266. “Wilhelm H Andreasen,” Find-A-Grave, https://www.findagrave.com/memorial/92151259, 92151259. 7267. “Anna Andreasen,” Find-A-Grave, https://www.findagrave.com/memorial/92151258, 92151258. 7273. Alvin Bernheart Skadberg, “Minnesota Death Index, 1908-2002,” July 18, 1970, Lake of the Woods, MN, https://www.familysearch.org/ark:/61903/1:1:V44F-FXC. 7277. Petra Skadberg, “Minnesota Death Index, 1908-2002,” December 25, 1996, Lake, MN, https://www.familysearch.org/ark:/61903/1:1:V4ZH-ZYF. 7278. Louisa Maud Hindle, “England and Wales Birth Registration Index, 1837-2008,” 1885, Bradford, Yorkshire, England, https://www.familysearch.org/ark:/61903/1:1:2XG1-QD7. 7279. Anders A Stridsklev and Louise M Hindle, “England and Wales Marriage Registration Index, 1837-2005,” October - December, 1911, Bradford, Yorkshire, England, https://www.familysearch.org/ark:/61903/1:1:26W8-WGZ. 7280. Cemeteries in Norway, “Lucie Solveig Elisabet Stridsklev,” http://www.disnorge.no/gravminner/bilde.php?id=3283414. 7282. Cemeteries in Norway, “Kate Ingeborg Stridsklev,” http://www.disnorge.no/gravminner/bilde.php?id=2891623. 7283. “Thorvald R Midbrod,” Find-A-Grave, https://www.findagrave.com/memorial/119742047, 119742047. 7284. “Petra K Midbrod,” Find-A-Grave, https://www.findagrave.com/memorial/119742046, 119742046. 7285. “Robert O Midbrod,” Find-A-Grave, https://www.findagrave.com/memorial/119742045, 119742045. 7286. “Dorothy Angeline Midbrod,” Find-A-Grave, https://www.findagrave.com/memorial/178400621, 178400621. 7287. “Kenneth C Midbrod,” Find-A-Grave, https://www.findagrave.com/memorial/119742044, 119742044. 7288. Julianna Golden, “Washington Death Index, 1965-2014,” July 31, 2010, Pierce, Washington, https://www.familysearch.org/ark:/61903/1:1:QLWS-41L6. 7290. Charles J Tanner, “Washington Death Index, 1965-2014,” March 25, 1992, Snohomish, Washington, https://www.familysearch.org/ark:/61903/1:1:QLW9-W5GP. 7291. 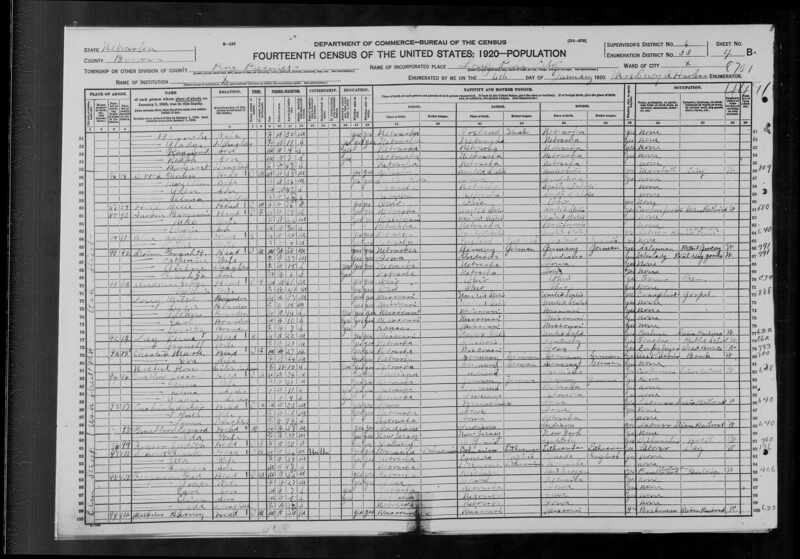 “United States Census,” 1920, NE, Brown, Long Pine, Pine Precinct, 4B, 6, 33, T625, 138, Bureau of the Census, US Dept. of Commerce, United States of America, January 6, 1920, Mrs. Lucy A Hurless. 7292. Arlene Christiansen Webb, “Christiansen family,” June 28, 2018.
from Norway and had saved her money to come to US. You guessed the rest! born. Then in August of 1924, Lillian was born and the family complete. 2018. She was almost 106.
baby--blond and blue eyes. Carole and I loved to babysit and play with him. same place! However, he was a pallbearer and rode in the hearst !! was much younger than Jamie. About 23-24 years. 7293. “Raymond L Drum,” Find-A-Grave, https://www.findagrave.com/memorial/103770990, 103770990. 7294. “Deaths and Funerals,” Roy Tanner, The Dispatch, Moline, IL, November 13, 1977, 5. Services for Roy Tanner, 66, of 135 W. 7th St., Coal Valley, former owner of Tanner Manufacturing Co., will be 10 a.m. Monday at Trimble Funeral Home, Rev. Lowell Dallman, Trinity Lutheran Church, officiating. Burial will be in RiversideCemetery. Mr. Tanner died Saturday morning in Moline Lutheran Hospital. He was born in Hastings, Neb. He married Helen Marie Swanson in 1935 in Moline. She died in 1959. He married Betty Williams in 1966. Mr. Tanner was owner-operator of Tanner Manufacturing Co., Moline, from 1950 to 1970, and later the owner of Roy Tanner Co., Moline. Survivors include a daughter, Mrs. Sally M. Westdale, Moline; son, David L. Tanner, Moline; five grandchildren; sister, Mrs. Frank Wobig, Zumbrota, Minn., and a brother, Elmer Tanner, Lincoln, Neb. 7295. “Deaths and Funerals,” Helen Tanner, The Dispatch, Moline, IL, May 11, 1959, 10. Mrs. Helen M. Tanner, 43, of '811 38th St., Moline, died at 7 yesterday morning in her home. She was employed as secretary to the president of the Uptown National Bank of Moline. Services will be at 1:30 tomorrow afternoon in Esterdahl Chapel with the Rev. John Genn, pastor of Wesley Methodist Church, officiating. Burial will be in Riverside Cemetery. Friends may call from 7 to 9 tonight at the chapel. The former Helen M. Swanson, the daughter of Louis and Ida Swanson, was born Feb. 6, 1914 in Moline. She was graduated from Moline High School and was a life resident of Moline. She was married to Roy Tanner on June 1?, 1935, in Moline. Mrs. Tanner was a member of Wesley Methodist Church and was active in the WSCS of the church. Surviving are a daughter, Sally M., and a son, David L, both at home; her mother, Mrs. Ida Swanson, Moline; a sister, Mrs. William Driscoll, Moline, and a niece, Mrs. Charles Tranter, Worland, W. o. 7296. “Deaths and Funerals,” Betty L DeVolder, The Dispatch, Moline, IL, August 24, 2006, 7. Betty L. DeVolder, 86, died on Sunday, Aug. 20, 2006, at Oak Glen Home, rural Coal Valley. A memorial service will be held 11 a.m. Saturday, Aug. 26, at Trinity Lutheran Church, Moline. Memorials may be made to Oak Glen Home in Coal Valley. Arrangements are being handled by Wendt Funeral Home, Moline. Betty L. Bowman was born on July 25, 1920, in Burlington, Iowa, to Willard and Isabel Parker Bowman. She married Lloyd Williams Sr. on July 27, 1938, in Burlington, Iowa. She later married Roy Tanner in 1966, and he passed away in October of 1977. She was then married to Rene DeVolder from 1981 until she was widowed again in January of 1992. Betty graduated from Burlington High School. She retired as an office manager for several local doctors, and she was a volunteer for the Red Cross and the hospital auxiliaries. She was a member of Trinity Lutheran Church of Moline. Betty loved her children and grandchildren, and liked oil painting, fishing, traveling, crocheting, gardening, and especially enjoyed her animals. Survivors (and spouses) include a son, Lloyd (Barb) Williams Jr., Rock Island; daughter, Linda (John) MacCall, Moline; a son, Michael (Nancy) Williams, Colona; a daughter, Marcia Conrad, California; and a son, Randy (Marilyn) Williams, Colorado; her sister, Donna Pence, Burlington; 14 grandchildren; 25 great-grandchildren; one great-great-grandchild; and longtime friend, Mary Daufeldt. Rock Island. 7297. “Betty L Bowman DeVolder,” Find-A-Grave, https://www.findagrave.com/memorial/15495221, 15495221. All sources of data are documented on the “Person Sheet” for each individual. My early data often came from less-than-reliable sources (e.g., “Sarah’s genealogy pages”). If the only sources for a person is something like that or worse there is no listed source for data, please take the information as only a suggestion and not a fact. (C) Richard Webb, 2019. All rights reserved.